Winters Bane has long been known simply as "Tim 'Ripper' Owens' former band." Before his 2 album stint with Judas Priest, Owens was the lead vocalist for Winters Bane, with the band releasing 1993's Heart of a Killer during his tenure. After Owens' departure, guitarist Lou St. Paul assumed lead vocal duties for the band's second album, 1997's Girth. Both are quite solid slabs of US Power Metal, although I personally prefer the Owens led Heart of a Killer. After the release of Girth, the band just faded into a long period of silence. St. Paul has recruited a new lineup, with the 2006 version of Winters Bane a three piece band. Lou St. Paul handles all guitars, the well known Mark Cross (Helloween, At Vance, Firewind, Metalium) is behind the drum kit, and lead vocalist Alexander Koch (Spiral Tower, Powergod) rounds out the trio. The band's website proclaims this album as a "must-have album for fans of shredding solos, powerful vocals, and masterfully heavy songwriting." While statements in this vein are often over exaggerations, I would have to agree with Winters Bane in this instance. Redivivus is a no frills, heavy dose of pure, balls to the wall heavy metal. There is no useless introduction building into the opening track, no keyboards, no orchestration, and no power ballads for which to hold your lighters in the air to be found on this album. Redivivus is heavy metal made the old fashioned way; loud and heavy guitars accompanied by powerful lead vocals. The moment you hit the play button, screaming shreds kick in right away with the opening track, Seal the Light. The pace never relents, with each of these nine tracks indulging the listener in heavy metal bliss. One thing that Winters Bane do not do on this album is rely on catchy, sing along chorus lines as a backbone for their songs. Instead, the melodies are very subtle, with the heavy guitar work and soaring lead vocals left to carry the songs. I must say, Redivivus very much allows the listener to swim in a deep sea of driving, powerful, and very heavy riffs. Each time I listen to the album, it seems that I discover or get hooked onto a riff that I had not focused on before. Also, as I touched upon earlier, the melodies are a very part of the songwriting. However, after several listens, they do become more apparent to my ears. With that being said, I think that element of the sound will result in Redivivus having a great lasting value. As advertised, flashy and energetic solos and shreds are generously spread throughout the album. I would liken this to 80's style traditional metal where loud guitars were flanked by a steady bombardment of solos and shredding. However, the bass guitar has a meaty presence, turned up just right in the mix. Even though the album is firmly grounded in the style and spirit of traditional heavy / US power metal, the sound quality is very contemporary and heavy. Vocalist Alex Koch does a marvelous job on this album. I had previously heard him with Powergod, and it is now quite apparent to me that the substandard (that's putting it nicely) music of Powergod was a big waste of Koch's talents. Koch has a very powerful mid range voice that is a perfect fit for this music. Furthermore, the man has an impressive range, allowing him to reach for some chilling shrieks when the music calls for it. He does avoid the common annoyance of vocalists that try to sing too high, too often. When he does venture into the higher octaves, he never sacrifices power to hit the highest note possible (truly above his range, in other words). Instead, he uses the full bodied, powerful delivery of his mid range for the majority of the album, with the occasional shriek added only to add emphasis when needed. As stated earlier, heavy guitar work and powerful songwriting dominate the songs instead of über-catchy chorus lines and melodies. The melodies on this album are quite subtle, but Koch effectively uses his voice to make them obvious after many, many listens to this album. All in all, Koch puts forth a very convincing and inspired performance on this album. I would be remiss not to mention drummer Mark Cross. As expected, he delivers the goods behind the kit. Driving double bass beats are at the core of his repertoire, as the intense riffing and heaviness of the music demand. However, Mark never becomes robotic or predictable at any time throughout the album. He maintains a varied approach to his work, yet maintains a forceful vibe, even when he takes a break from the double bass. One small complaint; I could have used the brief instances where Koch's voice is slightly distorted on this album. Thankfully, this only happens briefly during a couple of songs, but not at all would have been better. 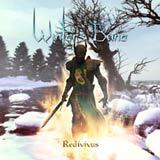 With Redivivus, I hope that Winters Bane are able to shed the "Tim Owens' former band" reference that seems to shadow them, and establish themselves as worthwhile and relevant force in the current traditional heavy metal scene. Redivivus is one hell of a comeback album that certainly stands tall on its own merits. Fans of pure, heavy riff driven metal played in a straight forward, traditional way should find a lot to like here. Long time visitors of the site may recognize the cover art for this album, or at least find the style of the cover to be familiar. None other than our own Chris supplied the artwork for this album! Two thumbs up from me on how the final product turned out. This is a huge upgrade from the cover art used on the two previous Winters Bane albums. Chris is currently building a new site where you can check out this album cover and others that he has worked on.